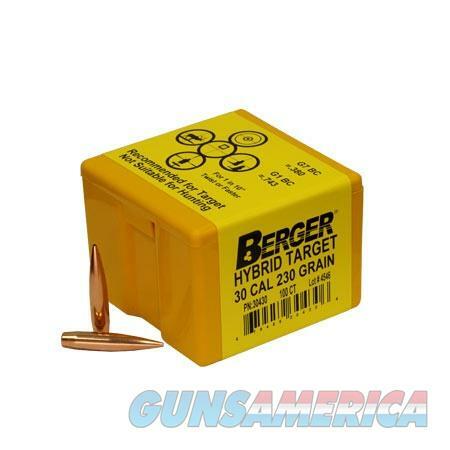 Description: Berger Bullets 30430 30 Caliber (0.308") 230gr Hybrid Boat Tail 100/Box Bergers Hybrid design blends the best of both worlds by incorporating two different shapes within the nose. As the bearing surface ends, a tangent ogive begins. This tangent section of the ogive results in the bullet being much less sensitive to seating depth. As you move forward along the tangent portion, the shape changes into a secant ogive (the shape used on the VLD bullets). This shape is very efficient in the wind and is why the VLD became so popular. The key to all this is not just the combining of these two shapes but also the partnership between the ballistician and the bullet maker. Berger's Chief Ballistician, Bryan Litz uses his expertise to combine the appropriate shapes for optimum performance.